We know you’ve been itching to get outside and your hands into some fresh dirt. Now, it’s early Spring and it’s time to get back in the garden! Cook’s Garden Sheds are perfect for storing garden supplies or creating a potting station. With its window and flower box, this shed option will fit your landscape! Take a virtual tour of it or visit your local Cook dealer to see it in person. There are so many resources online to help you do this! Start a board on Pinterest with different types of flowers and vegetables that you may not have tried before. BHG also has a free planner tool you can use to design your garden online. As you’re planning remember to check their water and sun needs. If there’s a plant that needs a lot of water, but you can’t reach it with the hose, then you may want to rethink its placement. Also, think about timing. When will certain plants be in full bloom, how long will they last? If you’re going to have vegetables in your garden, are there any restrictions on where they are grown? Consider the needs of each plant as you work on when and where you will place them in your garden. Remember this is your garden oasis, so make it yours and don’t be afraid to try something new! 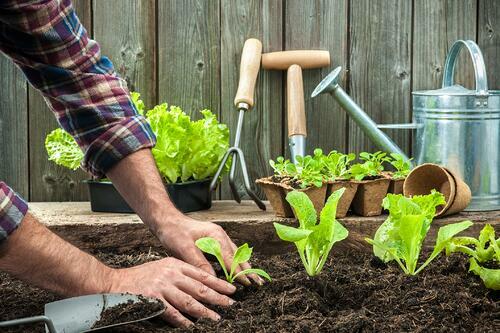 Here are some more tips from HGTV on planning your garden. Winter storms can take a toll on your garden too, so take a look around your space and see what needs to be repaired. -Stepping Stones - have these sunk into the ground a little too much? Reposition them. HGTV actually recommends adding additional soil or gravel below them to help them stay in place. -Fencing - any broken areas? It may not look that bad, but could it be an entry for unwanted animals? -Trellis/Arbor - These are beautiful but can easily be damaged or may just need a new coat of paint or sealant. -Birdbaths - Wash them out with a bleach/water solution found here. -Set your budget, shop and start planting! It’s always good to have your plan created and your budget set before you visit your local nurseries. You want to make sure you’re buying and planting each plant at the right time. Plus, without a plan you may buy too much or too little to fill out your gardening space. Here are 5 more important garden tasks to do this time of year! A Cook portable building is a great asset to any gardener. Remember you can customize any of the Cook buildings to fit your needs. Take a look at all of our shed styles!